Evil is growing strong in the lands of Asperia. The leaders of the good forces, concerned with the growing threat, gathered to conceive a way to overcome the looming danger. For forty days and forty nights the Ivian Priests, the wise Magi Archonts, and the proud Elvari Princes debated round an ancient stone table. Finally a new alliance was formed, sealed by the signing of The Trigon Pact. Fulfill your role in the world of Asperia and help the Pact to stop Aamon, the Lord of Corruption. 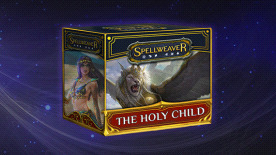 The long awaited story-driven Spellweaver campaign is finally available. Play through the missions and earn 100+ powerful cards of all rarities - more than enough to build yourself a very formidable deck!